A man is fighting for his life with a hyena. Or is he not? Am I seeing this correctly? The man seems to be opening his garment intentionally for the hyena. And the paw is fading into the fibrous apron of the man. It almost seems like cuddling! With a little imagination the man might be breastfeeding the animal. Strange. Within a few seconds the image has completely turned around for me from a life threatening fight to a tender tableau. But when I step back and take another look it almost instantly turns back again to its former ferocity. I become aware of more details. Are there tears in the eyes of that hyena? And is there a shining gem in its body? Or is that one of those all-seeing eyes? And why is the man not looking at this ‘cuddle-beast’ but at me? This detail of the elaborate mural ‘Wandering II’ is not realistic in the sense of photographic. The colours are not ‘right’, the leg looks like it is encased in armour, the face is a flattened mask. It is realistic in a different sense. I am familiar with an experience like this. I fight against something that I am afraid of, but suddenly the perception turns around and I sense that this is actually something meaningful that I can grow from. A crucifix is the most extreme example of this. You see a man being tortured; a man who is fighting for his life. But then… this man is also said to have saved the world in this way. With whom was Jesus struggling on Golgotha? With a wild beast – the devil? Or with God – the God of the all-seeing eye, the God who wept? Was it really a fight or was it an embrace in the end, almost a dance? 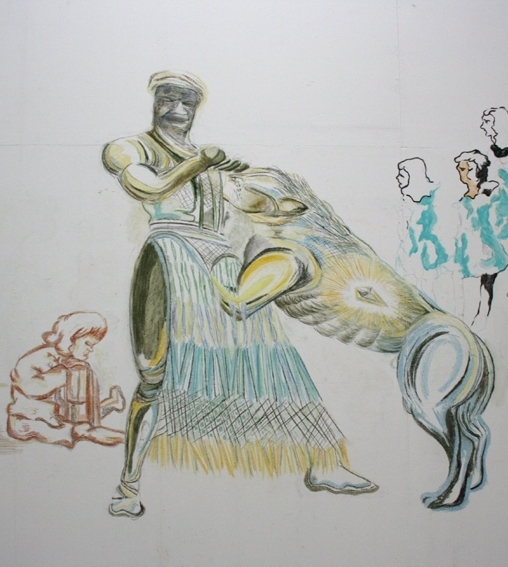 Marisa Rappard: detail mural ‘Wandering II’, 2011, ± 250 cm x ± 220 cm, chalk, pencil, charcoal. The sitting child on the left and the people marching on the right were made by Mariëtte Linders and Geert Bartelink. Reinier Sonneveld (1978) is a writer. He makes his living by creating short films and writing (mainly theological) books. He was the youngest writer in the Netherlands to receive the Prize for the Best Christian Book. He is also a member of the board of Artway.